Imagine feeling as though you don't fit in. As though you're different from everyone else (how isolating! ), or that perhaps you're gay. First hurdle. You live your life gay but you still don't fit in. Then you realize you're actually not your gender. Frightened doesn't begin to describe how you might feel. Then, try living this all out in the public as a child of very famous celebrities. To me it would be unimaginable. This is what Chaz Bono had to endure, coming finally to the realization that he wasn't Chastity Bono, the little girl whose parents were Sonny and Cher, but actually a man. This story will open your eyes and your heart as you come to understand the dilemma Chaz had to endure for most of his life as a girl and then as a woman. So, as he shared his young life as a female with the public, so does he now share this incredibly happy situation he's now in with us all. I feel positive Chaz's story will be an enormous source of comfort and relief to many with the same dilemma. Chaz goes into detail about how much like a boy he felt even as a six-year-old girl, running around with boy friends, and Sonny treating her more like a boy than a girl. Also of course, the public's perception did not help [It never does. In our non-famous lives there are those who "judge" us too. ], and coming out to his parents had to be overcome, as well as coming out to the world. 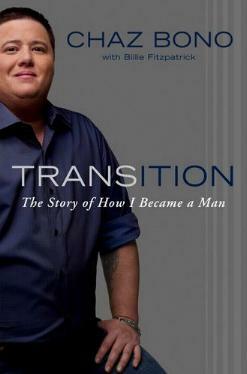 It wasn't easy trying to come to grips with his situation—He says, "I confused my male gender identify with my sexual orientation"—and the story of how Chaz Bono came to understand he wasn't a lesbian, how he dealt with it and moved on, is fraught with sadness, worry, and hope. Next was identifying and coming to grips with being transgender. As if this wasn't difficult enough, Chaz was also addicted to painkillers for intense period pain and endometriosis, which didn't help things. His description of actually transitioning isn't as gruesome as many would think; it's interesting, eye-opening, informative, and very brave. I found it fascinating. He also talks about his relationships and the love he has now. Chaz has given us (women) a special firsthand look at how different men and women are. Their feelings, emotions, and temperaments. Not many people can do that. I loved this: "...my relationships with my dogs and cats are fundamental to my life and my peace of mind." His early love of pets began a "lifelong, deep-seated camaradarie with animals". How moving! Conclusion - I salute you, Chaz! Very brave, very honest, and infinitely helpful to countless others. Thank you for sharing your moving story.